12x 6TB 7200 RPM SAS 3.5"
environment to drive business intelligence applications. front-end enterprise, and minimal-downtime cluster server systems. direct successor to the PowerEdge C6100. product family as well as an extremely dense and energy-efficient shared infrastructure chassis. server that can help you better manage your enterprise. Brand New Factory Sealed OCZ Deneva Series Solid State Drives Starting at $99.99. OCZ Deneva SSDs are designed and manufactured to solve today's enterprise storage challenges and address the limitations hard drive technology imposes on IT infrastructures. The Deneva Series delivers the industry's best performance while meeting the stringent reliability, security, and economical needs of enterprise storage environments. 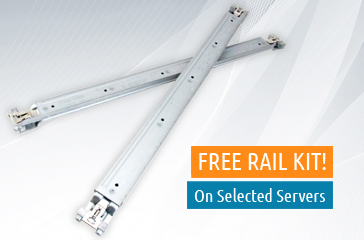 We offer free rail kits on selected servers. If available, rail kits are already selected by default into the configuration. No codes necessary!